Posted by Trixie. June 6th 2014. Striking and popular in many homes, Exotic Shorthair kittens and cats are fun and loveable characters ideal for any home. Making its debut in the show circuit of the 1950s, the Exotic Shorthair is a blend of the American Shorthair cat and the Persian. Over the years, cross-breeding also occurred with Russian Blues and Burmese creating unusual and beautiful cats ideal for showing. However, in the late 1980s, official breeding criteria stipulated that only crosses with Persians would be recognised. In 1986, the Fédération Internationale Féline recognised the Exotic Shorthair while the International Cat Association classes Exotic Shorthairs as Persians. An Exotic Shorthair has medium-sized muscular bodies which are fairly low to the ground and is large boned – as can be recognised by its broad, strong shoulders. Paws are large and round with tufts between the toes – a very desirable breeding feature. The tail is short and thick and the coat; thick and slightly longer than fur of other shorthaired cats. The most distinctive feature of an Exotic Shorthair is its head – large and round with full cheeks. Its eyes are widely-spaced, big and distinctly coloured in relation to the hue of the coat. Ears are small with rounded tips. 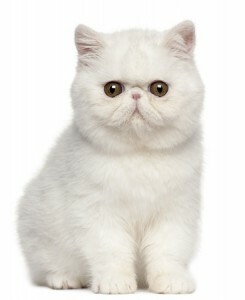 Owing to its mixed ancestry, the Exotic Shorthair displays a range of appealing characteristics. Like its Persian ancestors, it is calm and gentle in nature and needs the regular company of its owner. It gets on well with other cats and dogs and dislikes being left alone. It also has a lively side to its nature which comes from the American Shorthair part of its personality. It’s often a good mouse hunter for this reason. Its voice is soft and it will enjoy greeting its owner when they come home. It also enjoys the sound of familiar voices so, if it has to be left alone for a few hours, a radio playing at low volume will go some way to keeping loneliness at bay. The Exotic Shorthair enjoys staying indoors as long as it has some toys to play with and an owner who will give it attention. A feline friend then is even better as they will provide companionship and fun for one another. Like all cats, the Exotic Shorthair is able to look after itself well in spite of its dense Persian fur. Weekly brushing is recommended for the removal of excess hair to prevent shedding and unpleasant fur balls. Its flat face makes it prone to tear overflow which can cause dampening and staining of the face. Wiping the face with a moist cloth will counter this. 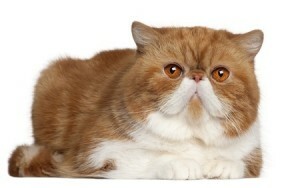 Exotic Shorthairs are prone to feline polycystic kidney disease (PKD); a condition which has a significant incidence in Persians. This condition can lead to kidney failure. 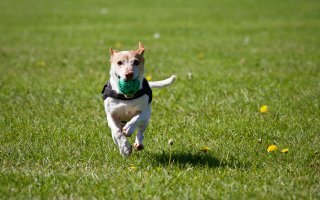 Studies have shown that PKD is present in 40-50% of exotic breeds and DNA screening is advisable in order to control its spread. To this end, experts advise that cats which are PKD positive are spayed or neutered.